Solves an n-dimension, homogeneous linear system of differential equations with solutions in numeric form. An n-by-n matrix that describes the linear system. This node works properly for almost all cases of real matrices that have repeated eigenvalues, complex conjugate eigenvalues, and so on. The exception is the case of a singular eigenvector matrix, that is, a matrix in which the eigenvectors do not span the whole space. If the eigenvector matrix is singular, this node returns an error of -23016. End time for solving the differential equations. Interval, in seconds, between the times at which this node evaluates the model and updates the model output. Points of time at which the node solves the differential equations. The method yields equidistant time steps between start time and end time. 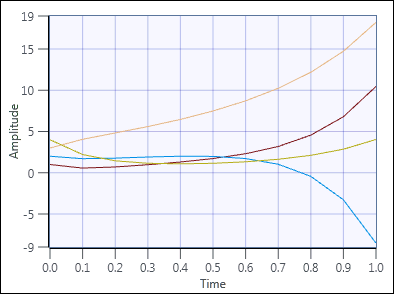 Values of the variables over time. Each row of x contains the values evaluated at a particular time and each column contains a history of a particular value over time. A is an n-by-n real matrix. The matrix SAS-1 has diagonal form. The solution x(t) can be determined by back-transformation: x(t) = S-1y(t). with x1(0) = 1, x2(0) = 2, x3(0) = 3, and x4(0) = 4.